I call KC, or Ken Carswell, the “mad scientist” when it comes to vision and tracking training for hitters. He’s had the Air Force come into his facility in Kansas City, Missouri to pick his brain! Over the last couple years, he’s consulted with top vision Doctors, and has done a ton of research and study in the field of vision and tracking. KC and his brother have played baseball at the collegiate and professional levels, so he understands the demands of trying to hit a 95-mph fast-ball…or a twelve-to-six curveball. KC is a good friend of mine who not only understands our hitting philosophy, but uses technology to “melt-down” his hitters’ vision and tracking skills, then build them up as unknown pitch crushing machines. He works out of his facility, but also develops software and technologies that will soon be mobile to train hitters in the comforts of your own home or academy. 4 – 8 week preparation period. Get extra batting gloves (plenty) and maybe some pine tar. You will have more reps than anyone else in that tournament. We will emphasize “approach”. You’re going to know that you have taken more cuts than every other person in participation. Your eyes are going to be more prepared visually than EVERYONE else in the stadium! Your eyes are going to be STRONGER. Your eyes will aggressively “hunt” the target, in this case, the baseball. It’s nuts really. We will start you on vision training and “eye food”. Yes. I said, “eye food”. You can expect to spend a tremendous amount of time in the dark. 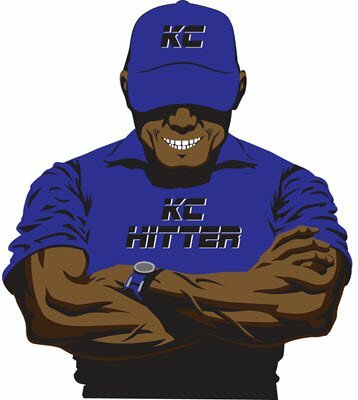 We will be using the KC Hitter facility and our “BatterzEye” training system exclusively. You can also expect to see the baseball like you haven’t before. You’re going to pick up rotation earlier than you ever have. Velocity will appear slower, both release point and the baseball (laces) will be clearer and easier to see. Your anticipation of the off-speed will also be enhanced. The longer we train, the more you will “see”. The quicker you will become and the more confidence you will develop. Oh, and you will hit the ball harder and far more consistently than in the past. We can enhance your vision from 15% – 154%. 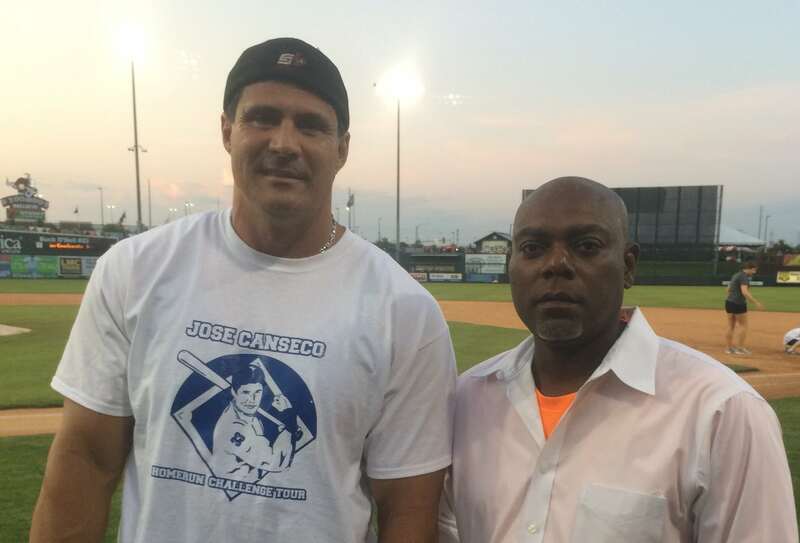 When KC first reached out to me, I “trolled” his website and found this picture…at the time, I had just competed in Jose Canseco’s Home Run Derby Challenge Tour. Small world! What makes me different? I am different because I know that whatever you think you are seeing, isn’t nearly your potential and in 4-8 weeks (earlier), you’re going to be amazed. What’s really important is that the scouts will be too. I am different because I can help you change what you see. My influences? I learn something from every player/coach I encounter. I include youth players, as well. The first four years of my career I was fortunate enough to manage a facility in KC where MLB/Minor league players trained prior to spring training. I was more fortunate to be invited to participate in their pre-season preparation. By being the first full time non MLB hitting guy in Kansas City, I was also afforded the opportunity to work with some legit young hitters. CLICK HERE to see a list of KC’s influences. Beginning in 1983 I started my hitting library. I’m still partial to “The Art of Hitting .300“, possibly because it was one of my 1st. I don’t have a good answer here. In reality, Joey mentioned many of the books I like on his previous site. I have read many hitting books but in my latter career, the books I read are about human aptitude, the power of the brain and achieving positive outcomes despite physical limitations. Since I’ve gone down this vision path, I have more on my mind than hitting. This technology applies if you drive a car or wear glasses. Human Performance. “Hit the curveball before it breaks.” That’s the most recent bad one I’ve heard (yesterday, by a high school hitter). Possibly not the worst, but it is bad. “I crushed that ball.” No, son, that’s a pop up and I’m tossing you underhand. “Finish high.” Not saying that’s wrong necessarily, but you need to be in the strike zone for a while. I watch guys finishing before contact. “Wiffle ball on a stick” – I’m just sayin’. It may be great, but my observation has been guys get loopy after using it. “Hiring bad help” – More recently, it seems that anyone with a book and a little money can command the attention of and ruin a lot of promising athletes. There is quality instruction available, invest the time and resources to know you’re making a solid choice. Chasing around and spending lots of money on club ball when there are scores of teams in the neighborhood that can beat your team. The money could be better spent on training. Is there a seminar or workshop that prospective coaches can attend for the visual training? My apologies for the delayed response. Thank you for your question, it is always great to hear from a motivated prospective coach looking to learn. There is a seminar for coaches and prospective coaches. It is in the works, early development stages and it is something we are very excited about. Please stay in touch and make sure we have a way to let you know when this program will be presented. How’s this? As a reader,coach,hitter etc, I’m reading the article I sent you after you posted it. My first thought? “I thought this was a vision guy and he doesn’t address vision in the first myth? !” My bad! btw, thx for taking a look at KC Hitter. Great point KC! Vision and tracking is such an under-represented focus in hitting. That’s why I wanted to introduce KC Hitter to my readers. I think you bring an original perspective to vision and tracking for hitters. Well fellas, Focusing, visualizing and tracking the ball is most important especially in the game of hitting/making good hard barrel to ball contact due to the fact as MR. Ted Williams always said, Hitting a round moving baseball with a round bat is the most difficult task to achieve within all sports while attempting to adapt to the near impossible task of focusing/shutting out/blocking out any and all back ground noises, foreground and peripheral vision distractions a batter encounters during each pitch, each time at bat during any given game., one cannot hit what one cannot see, it is easier to hit a stationary target than a moving target. K.C. you say your students will spend a tremendous time in the dark during the preparation period, my students also spend a lot of time in the dark, I have each student use a miners lite attached to their fore head while they are batting I also have my pitchers execute certain pitching movements using a lite attached to their fore head. I train my batters to “LOCK THEIR EYES IN ON THE BALL RIGHT OUT OF THE PITCHERS HAND” and to track the ball to contact. You and I have something in common, I spent some time helping Sonny Maynard several years ago, and I have also learned some important aspects of the game from some of those names on your list of mentors, Sonny, included. Tell Sonny hello When you see him. Thanks Don for sharing. The miner’s light drill is great, and I’m not sure if that was what K.C. does with his hitters. You really have to check out what K.C. is doing and reach out to him on his site. Tell him I sent you 🙂 What he’s developing will blow your mind!